Linkage Mapper is a GIS toolbox designed to support regional wildlife habitat connectivity analyses. It consists of several Python scripts, packaged as an ArcGIS toolbox, that automate mapping of wildlife habitat corridors. The toolbox is comprised of six tools, described below. The primary and original tool in the toolbox is Linkage Pathways. 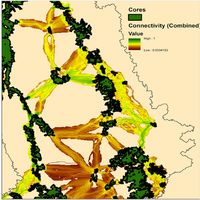 Linkage Pathways uses GIS maps of core habitat areas and resistances to identify and map linkages between core areas. Each cell in a resistance map is attributed with a value reflecting the energetic “cost”, (i.e. difficulty and mortality risk) of moving across that cell. Resistance values are typically determined by cell characteristics, such as land cover or housing density, combined with species-specific landscape resistance models. As animals move away from specific core areas, cost-weighted distance analyses produce maps of total movement resistance accumulated. The Linkage Pathways tool identifies adjacent (neighboring) core areas and creates maps of least-cost corridors between them. It then mosaics the individual corridors to create a single composite corridor map. The result shows the relative value of each grid cell in providing connectivity between core areas, allowing users to identify which routes encounter more or fewer features that facilitate or impede movement between core areas. Linkage Pathways also produces vector layers that can be queried for corridor statistics. Pinchpoint Mapper uses Circuitscape to identify pinch-points (a.k.a. bottlenecks or choke points) in corridors produced by Linkage Mapper. Centrality Mapper analyzes core and corridor centrality in networks produced by Linkage Mapper. This can help prioritize important corridors. Climate Linkage Mapper a tool that fine-tunes the locations of corridors following climatic gradients to facilitate species range shifts under climate change. Linkage Mapper is one of the open source initiatives that CBI sponsors. For more information about Linkage Mapper development, application, or workshops, please contact John Gallo. To get important announcements about the Linkage Mapper Project you can subscribe to CBI’s newsletter. To be more engaged, you can join the Linkage Mapper community and/or subscribe to John Gallo’s Action Research email list.